The tutorial explains how to use COUNTIFS and COUNTIF formulas with multiple criteria in Excel based on AND as well as OR logic. You will find a number of examples for different data types - numbers, dates, text, wildcard characters, non-blank cells and more. Of all Excel functions, COUNTIFS and COUNTIF are probably most often mixed up because they look very much alike and both are purposed for counting cells based on the specified criteria. The difference is that COUNTIF is designed for counting cells with a single condition in one range, whereas COUNTIFS can evaluate different criteria in the same or in different ranges. The aim of this tutorial is to demonstrate different approaches and help you choose the most efficient formula for each particular task. As already mentioned, the Excel COUNTIFS function is purposed for counting cells across multiple ranges based on one or several conditions. The COUNTIFS function is available in Excel 2016, 2013, Excel 2010, and Excel 2007, so you can use the below examples in any Excel version. criteria_range1 - defines the first range to which the first condition (criteria1) shall be applied, required. criteria1 - sets the condition in the form of a number, cell reference, text string, expression or another Excel function, required. The criteria defines which cells shall be counted and can be expressed as 10, "<=32", A6, "sweets". [criteria_range2, criteria2]… - these are additional ranges and their associated criteria, optional. You can specify up to 127 range/criteria pairs in your formulas. In fact, you don't have to remember the syntax of the COUNTIF function by heart. Microsoft Excel will display the function's arguments as soon as you start typing; the argument you are entering at the moment is highlighted in bold. Excel COUNTIFS - things to remember! 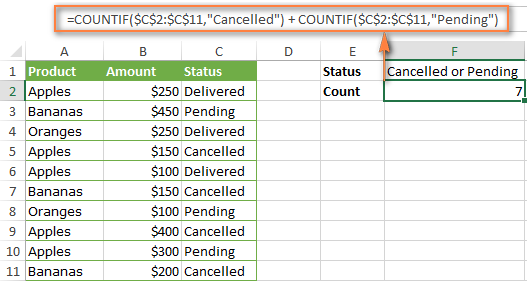 You can use the COUNTIFS function in Excel to count cells in a single range with a single condition as well as in multiple ranges with multiple conditions. If the latter, only those cells that meet all of the specified conditions are counted. Each additional range must have the same number of rows and columns as the first range (criteria_range1 argument). Both contiguous and non-contiguous ranges are allowed. If the criteria is a reference to an empty cell, the COUNTIFS function treats it as a zero value (0). You can use the wildcard characters in criteria - asterisk (*) and question mark (?). See this example for full details. Below you will find a number of formula examples that demonstrate how to use the COUNTIFS and COUNTIF functions in Excel to evaluate multiple conditions. This scenario is the easiest one, since the COUNTIFS function in Excel is designed to count only those cells for which all of the specified conditions are TRUE. We call it the AND logic, because Excel's AND function works this way. Suppose you have a product list like shown in the screenshot below. You want to get a count of items that are in stock (value in column B is greater than 0) but have not been sold yet (value is column C is equal to 0). This COUNTIFS formula returns 1 because only "Grapes" have "0" value in both columns. Using a simpler formula with a single criteria_range like COUNTIFS(B2:C7,"=0") would yield a different result - the total count of cells in the range B2:C7 containing a zero (which is 4 in this example). As you have seen in the above examples, counting cells that meet all of the specified criteria is easy because the COUNTIFS function is designed to work this way. But what if you want to count cells for which at least one of the specified conditions is TRUE, i.e. based on the OR logic? Overall, there are two ways to do this - by adding up several COUNTIF formulas or using a SUM COUNTIFS formula with an array constant. You can find a few more ways to count cells with OR logic in this tutorial: Excel COUNTIF and COUNTIFS with OR conditions. By and large, COUNTIFS formulas for numbers fall into 2 categories - based on several conditions (explained in the above examples) and between the two values you specify. The latter can be accomplished in two ways - by using the COUNTIFS function or by subtracting one COUNTIF from another. The same result can be achieved by subtracting one Countif formula from another. The first one counts how many numbers are greater than the lower bound value (5 in this example). The second formula returns the count of numbers that are greater than the upper bound value (10 in this case). The difference between the first and second number is the result you are looking for. =COUNTIF(C2:C10,">5")-COUNTIF(C2:C10,">=10") - counts how many numbers greater than 5 and less than 10 are in the range C2:C10. This formula will return the same count as shown in the screenshot above. =COUNTIF(C2:C10, ">=5")-COUNTIF(C2:C10, ">10") - the formula counts how many numbers between 5 and 10 are in the range C2:C10, including 5 and 10.
add an ampersand (&) before a cell reference to construct a text string. Please notice the use of absolute cell references both in the criteria and criteria_range arguments, which prevents the formula from being broken when copied to other cells. For more information about the use of an ampersand in COUNTIF and COUNTIFS formulas, please see Excel COUNTIF - frequently asked questions. Question mark (?) - matches any single character, use it to count cells starting and/or ending with certain characters. Asterisk (*) - matches any sequence of characters, you use it to count cells containing a specified word or a character(s) as part of the cell's contents. Tip. If you want to count cells with an actual question mark or asterisk, type a tilde (~) before an asterisk or question mark. Now let's see how you can use a wildcard char in real-life COUNTIFS formulas in Excel. Suppose, you have a list of projects in column A. You wish to know how many projects are already assigned to someone, i.e. have any name in column B. And because we are learning how to use the COUNTIFS function with multiple criteria, let's add a second condition - the End Date in column D should also be set. 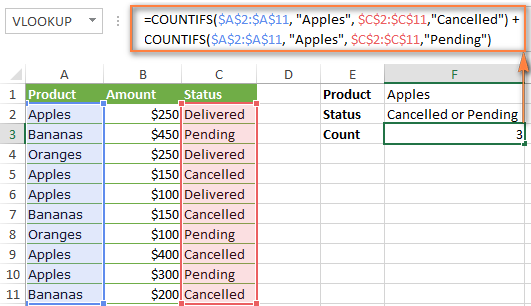 Please note, you cannot use a wildcard character in the 2nd criteria because you have dates rather that text values in column D. That is why, you use the criteria that finds non-blank cells: "<>"&""
The COUNTIFS and COUNTIF formulas you use for dates are very much similar to the above formulas for numbers. To count the dates that fall in a certain date range, you can also use either a COUNTIFS formula with two criteria or a combination of two COUNTIF functions. 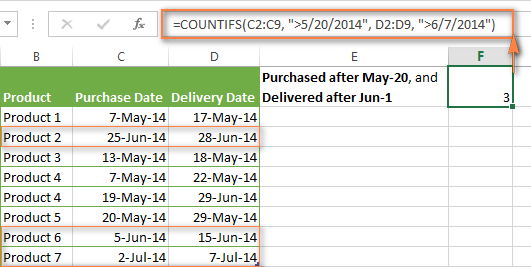 You can use Excel's TODAY() function in combination with COUNTIF to count dates based on the current date. For example, the following COUNTIF formula with two ranges and two criteria will tell you how many products have already been purchased but not delivered yet. This is how you count cells with multiple criteria in Excel. I hope you will find these examples helpful. Anyway, I thank you for reading and hope to see you on our blog next week! 1,054 Responses to "How to use Excel COUNTIFS and COUNTIF with multiple criteria"
I have created a checklist in Excel with checkboxes under each heading (3 headings) with the option of TRUE,FALSE or #N/A (as some of the items may not be applicable). I have assigned a cell to each check box. I am trying to capture the completion rate of the items required in my checklist (both when required and/or applicable information has been received). I have used COUNTIF to capture the TRUE data in each subheading, but I cant seem to figure out a formula to capture the required data and additional data when applicable to score as available points and actual points. Any ideas? I am searching on how to count cells based on specific text within a date range. E.G. I have a column with codes: UA, RO, etc. I have another column with the date the the code was created. I need to count the number of cells with UA from 09-01-2018 and 09-30-2018. I find the syntax for counting a cell with the text "code" and how to "sum" numeric values in a date range. I just don't seem to be able to find the syntax that combines both counting cells for specific text within a date range. You can count multiple criteria by using the COUNTIFS function. In your case where the first column is in A67:A81 and the attendance is in B67:B81 put "Mad" in C69, "Dad" in C70 and "Chad" in C71. Then in D69 enter =COUNTIFS(A67:A81,C69,B67:B81,"P")and in D70 enter =COUNTIFS(A67:A81,C70,B67:B81,"P")and in D71 enter =COUNTIFS(A67:A81,C71,B67:B81,"P"). You'll have the attendance for the Nov range next to each name. I am trying to figure out a formula that if P2 is =1000 add 120 days to the date in M2. I cannot seem to get it to return a correct answer. Any help is greatly appreciated. I should clarify that cell M2 is formatted as a date. I'm sure my formula is no where close to where it needs to be. In each row (twenty schools) I have two columns (B, C) of attendees (student, non-nonstudent). How would I count whether a school is represented by either a student or a non-student (i.e., count if b=>0 or if c=>0)? I tried =countifs (B3:B22,">0", C3:C22,">0") and tried =countifs (B3:B22,">0") + countifs (C3:C22,">0"). Neither of these worked. Could you please send me the table, so that I can do it. Dear friends, help to simply my work in excel. I have daily stocks data in A1:A100 for day 1 and B1:B100 for day 2. Now i want to compare B column with A and result to display in C as how many times increased or decreased. i.e 2X times increased, 5X times decreased like. 4- Exam as Pass,Fail.Pending. "Duplicated"
6- Record of data entry is IDENTICAL. The project's owner wants to know the percentage of the student pass the exam(per class & subject) in a table where the row is the class and the column is subject. The issue here as the student had repeated the exam different times in both different classes and subjects. The owner is accepting to have one exam result within a three month period if the student repeated the same exam in the same class and for same subject. I used countifs but its really exhausting exercise for huge data. Is there any other solution ?!! 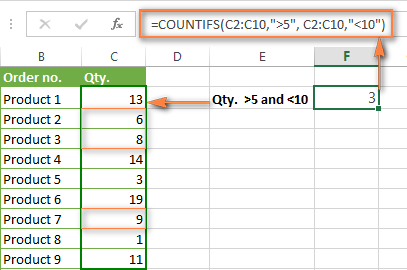 You can learn more about COUNTIFS with multiple criteria in Excel in this article on our blog. looking for some advice, I'm trying to count different values in excel or sheets. example: counting sick days for employees. How can I build something that recognizes SICK SICK/ and /SICK and also adds up the different values of each. Thanks in advance. How do I also make it add NA? How should I compute the formula . P/S : I want to count Row B "3" if there is Unique data in Row A.
I have a question with Countifs..
Can i have the criteria rage more than 1 column ? eg: I have 3 columns which has "Critical, High & Medium" and one column with countries (India , Pakistan). Now i need to know how many critical in India. Am I able to use the ABS function on this formula somehow? Is there something I am missing here? Tried all sorts of strategies around it and I am not able to do it. Please help. I want to get the numbers of "banned" items on a specific date? if my list is included with deleted items. When I use Countif, I highlight the range which enters correctly (C2:C295, but when I click the first cell that I want to count for the criteria it just enters "Extract" in the field and doesn't work. I've done this before and always have issues but eventually figure it out. Why doesn't it just read the value when I click the cell? Why does it say Extract and then not count how many times the value appears in the range???? How to put conditional format for above date before 30 day's it should reflect in red color means it's come for due. I are in need of some help. I know a little bit of excel but not what my boss needs. Column C has the dates that items will be shipped, column d has if the item will be lined, column e has if the item will be blasted, and column f has if the item will be painted. She is wanting me to have a formula calculate the items for each column on a certain date, if that makes sense. For example: On day 04/12/2019, we want to know how many items will be shipped that were lined, blasted or painted separately. for each cell, there is the dollar amount. I was wondering if you could help me please - I need to create a formula that counts the number of times there is an overdue date in column I, where the corresponding cell in column J is blank. An entry into column J (date reviewed) results in the conditional formatting being removed, so that it returns to black. I need to create a formula to count the number of dates in column I which are older than today but only if the corresponding cell in column J is blank. I have tried =COUNTIFS(I6:I260,"<TODAY()",J6:J260,""&"""") but suspect it is counting the auto-fill formula in column I. Please help!!!! In your Product, Amount, Status data range, how would you find the Number of Fruits Canceled? So in this example, the goal would be to get a unique count of Product that was Canceled. Bananas and Apples show up twice, but the result would only return the unique instances of Canceled for each. Thank you! The file no 0557_0001 has 2 pages which is refereed as sequence ie is Sequence 2. I have used =COUNTIFS(B:B,B1) to get the sequence.I need to include the addition part and populate which does not tally the sequence. Example: When we add : file no 0557_0001 + 2 pages gives 0557_0003 but if i have the next file as 0557_0004 , it should populate the difference as -1.
if someone do 12 hrs duty in a day but we take 8hr per day & 4 hrs as an ot(over time) payment should be make by diff rates of 8hr & 4rs ot. Could any please help on the below? I know I need to use the formula ''Countifs'', however when I try to put them together it shows the message Value, clearly I'm doing something wrong! (30) entries). Print a copy with formulas displayed and another copy with actual data. I want the formula to count with 2 conditions - first it should filter column for a particular text and then it must filter another column in a particular date range. This is not working, please guide. For the above . . . Formula 1. 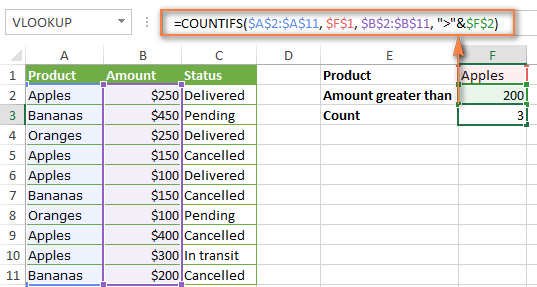 Add up two or more COUNTIF or COUNITFS formulas - Am using the same data on the screen, but get 7 . . . not 6 as shown in the screen-print? 7 is the correct answer. In my table, there was a trailing space in one of the cells, because of which that cell was not counted. After removing the extra space, I also got 7. Thank you for pointing that out, good catch! But the result is wrong. Column C is date column and it varies from 01st Jan 2017 till date. I will be using the above formula to count cells which contains value ICT_W* in column B for each year separately. How can I count a row of two columns only when a text in type in either cell. Also, how to I exclude a cell to that formula. Thank you for your help. The article is interesting. Additionally, how for example count the status e.g. "approved" or "not approved" within a particular date range.Thank you. but now I need the count of the status only within the particular date range. I really need help for this. Thanks. Can someone help me with this formula. =IF(COUNTIFS($D:D,$M:M),"PRESENT","NOT FOUND") but if no value entered in M:M nothing will show in column O:O. Currently if there's no value in M:M the value in column O:O is "NOT FOUND" I want the "NOT FOUND" will only appear only if there's value in M:M. Thank you very very very much.. Using 1 column I want a count of the number of cells that have either an X or a number that is not equal to zero. I have a list of employees, with dates they started and dates the ended the job. I need to know the count of employees, for each quarter, for the last 2 years. How would I get this? Really! The solution on excel Countifs just clicked instantly. Thanks a ton!